Stunning black and white feathers with bright orange tops! 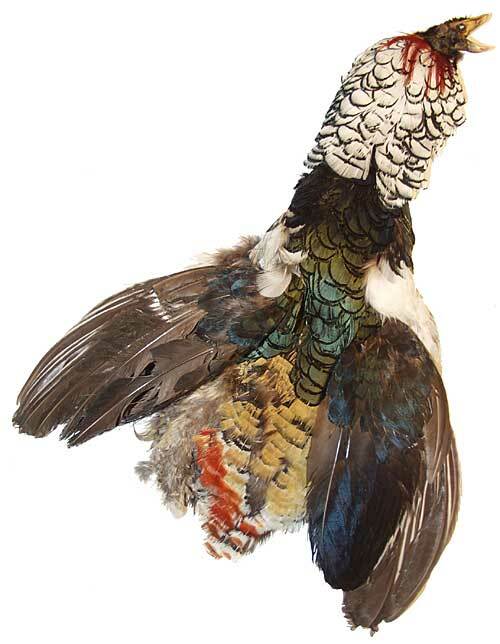 These are the coverlet feathers on the tail of a Lady Amherst pheasant. One of our most popular feathers. Great for use in fans, dream catchers, and much more. One of the most beautiful pheasants! The tails are a rust brown color with dark stripes on one side and mottled on the other. The center tails are fully tiger striped are mostly white with dark bars and speckles. Lady amherst pheasant skins with wings and crest. Each skin has hundreds of small feathers ranging in color from greys to reds and yellows. These feathers are typically about 1-2 inches long but the size varies. Excellent for use in small dream catchers and other crafts. Note that these skins are intended to be plucked for their feathers. They have only been scraped and dried and are not tanned. Great coverlet feathers that are white with black tips. There are also some deep red feathers at the top of the neck. Excellent for use at the base of larger feathers in fans, hair ornaments, and much more.